Fountain enjoyed a 5-4 victory over King Street Tavern in the Portsmouth Men’s Winter League division two. Ken Dean, Colin McKean and Kyle McManus gave Fountain a 3-1 lead, with only John Fields providing any early resistance for King. Michael Chandler pulled a set back, only for Laurie Clark to win the next bout for Fountain and put them within a set of taking the match. King Street’s James Elliott kept his side in the match, before Michael Palmer bagged the points for Fountain. Jon Davison won the last set as a consolation for King. Thatchers moved up to second in division three with a 5-4 win against Tap. Steve Hansford opened proceedings for Tap, only for Thatchers to move 4-1 up with wins from Steve Wilson, Michael Whitbread and Peter Lamb and a walkover for Chris Williams. Tap restored parity as Paul Boden, Chris Cobb snr and Ron Albury made it 4-4, but it was Thatchers’ Chris Lawrence who won the crucial final set to take the match. Gamblin put Rutland 2-1 up. Three on the trot from Len Eastland, Craig Dyer and Ian Rogers put Leopold in the driving seat before Dale Adams pulled Rutland back to 4-3. Kev Goodall gave Leopold an insurmountable lead, leaving Steve Houghton to win a late consolation for Rutland. Arnie Le Rouge, Jamie Poulter and James Woolley all edged Mermaid in front, but each time Drake hit straight back as Martin Coles, Terry Phillips and Ken Patrick were on the mark. Drake won the remaining games thanks to Chris Potter, Carl Spratt and a walkover for Jeff Lovelock. Lord Chichester B pulled level on points with Jolly Taxpayer C at the head of division one as they came from behind to secure a 5-4 victory in a game that saw 65 scores of 100 or more. Adam Fieldman won the opening set for Taxpayer, and despite Chichester’s Richard North recording a 12-dart leg and 130 finish, he was beaten by Taxpayer’s Lee O’Donovan who threw an 18-darter. David Smith extended Taxpayer’s lead to 3-0, before team-mate Paul La Roche scored 180 but lost to Mike Feaver, who put a first set on the board for Chichester. Darren Barnes doubled Chichester’s tally with a pair of 15-darters and a 130 game-shot. Momentum then swung to Chichester, with John Madgwick jnr, Buster Turner and Dean Jones all on the mark to win the match for Chichester. 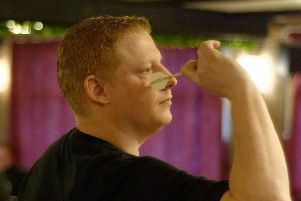 Madgwick threw an 18-dart leg. 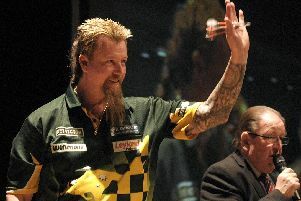 Meanwhile, their team-mate, Danny Smith, finished a leg in 17 darts. There were 18-darters by Lee Smith (Phoenix North End B), Sam Palmer (Shearer Arms), Ian Pearce (Rose in June B) and Martyn Carlyle (Portland Arms). Tony Bell (Clarence Gardens) hit a 104 game-shot, Liam Webb (Lawrence Arms) recorded a 103 finish, and Pete Hickman (Phoenix Southsea) and Aaron Shambrook (Clarence Gardens) checked-out on 102 and 100 respectively. Josh Olden (Fawcett Inn A) and Jon Macdonald (Oyster House A) all fired in maximums. Newcome Arms B are looking for players, anyone interested should contact Ron Neale on 023 92838434 or 07795 380393.